Unlikely as it sounds, not everyone working at Planned Parenthood's clinics is a diehard supporter of abortion rights. Or more precisely, while they agree that women should be allowed to terminate pregnancies, they'd rather not be in the room -- or even the building -- while it is happening. Some staffers struggle to reconcile their pride in providing quality medical services with their employer's larger mission -- ensuring that all women have safe, unfettered access to birth control and abortion. Others wonder if they can confide in a priest about where they work, and what to tell patients who come in desperate, unable to care for a child but believing they will "burn in hell" for ending their pregnancies. Vincent Lachina is a chaplain at Seattle's Planned Parenthood. Into this mire dives Vincent Lachina, a Baptist minister raised Southern and conservative, who spends much of his time telling the staff that God is a loving presence and that they are forgiven. His work in Western Washington, the nation's only Planned Parenthood affiliate to have a full-time chaplain on staff, signals a growing awareness within the abortion rights movement that disregarding the moral and religious questions shared by many supporters has been a mistake. "By ignoring people of faith, we had, in essence, handed a political weapon to people who are against choice," said Chris Charbonneau, president of Planned Parenthood of Western Washington, who was instrumental in getting a full-time chaplain in 2003. Lachina is the second minister to have the job. "The notion that if you're religious, you're anti-choice and if you're pro-choice, you're a total heathen is a dichotomy that shouldn't be preserved," Charbonneau said. While anti-abortion groups eagerly anticipate the Supreme Court confirmation of Samuel Alito, who has indicated he believes there is no constitutional right to abortion, and lawmakers in Indiana and Ohio have already introduced legislation banning the procedure, Lachina, with his cleric's collar and neatly trimmed gray hair, insists there are many clergy quietly working to support abortion rights. Planned Parenthood's very founding hinged largely on support from American Episcopal bishops, he noted. On Sunday, the 33rd anniversary of the Supreme Court decision legalizing abortion, Lachina, former pastor at the Grace Gospel Chapel in Ballard, will be preaching in Woodinville to rally optimism for Roe v. Wade, despite its "somewhat bleak" future with the high court. On Monday, he'll mark the day with a celebration on the steps of the Federal Building in Seattle. But the bulk of his time is spent reaching out to clergy around the state who support abortion rights. "It's been much easier than I thought it would be," said Lachina, 60, who celebrated his 42nd year in ministry in December. In just one year on the job, Lachina has established a statewide network of more than 100 clergy from various faiths willing to counsel Planned Parenthood clients. He has met with staff at half of the agency's 51 clinics and drafted a pastoral letter for patients -- signed by 12 clergy members -- saying they believe abortion is morally permissible. "I expected a lot of opposition, but as I've traveled the state people are generally courteous and supportive of what I do," Lachina said. He knows his work raises eyebrows. Lachina has priest friends who won't meet him for lunch on Planned Parenthood's property. His own family, Republican abortion foes all, nearly fainted when he announced who his new employer would be. "They just collectively sucked all the air out of the room and wanted to fall to their knees and pray," he said. " 'Oh, why would you do something like that?' they kept asking." The reason, Lachina says, is that he believes women should be able to do what they want with their bodies and that they are, little by little, losing that right through the courts. On Wednesday, for example, the U.S. Supreme Court essentially upheld a New Hampshire law requiring minors to tell their parents before getting an abortion -- except in the case of a medical emergency. Other states have mandated waiting periods, and a bill recently introduced in Arizona would order doctors to tell abortion patients that their fetuses could feel pain. Washington state, which strongly supported abortion rights years before the Roe decision, has its own battles. Charbonneau expects legislators here to float a parental notification bill this session. Though pregnancy termination constitutes about 2 percent of the services provided at Planned Parenthood -- most of which focus on birth control and medical testing -- even staff who fully support a woman's right to make reproductive choices say abortion days take a toll, especially when they see repeat customers. For Mona Hinojos, 30, who works at the Vancouver clinic, just being in the office made her nervous. She is a staff trainer, not a clinician, but the magnitude of what was about to happen was unshakable. "The very first time I was involved, I thought, 'How am I going to deal with this?' " she said. "I was raised Catholic, so it's hard. But the two things -- you kind of weigh them out. Women's rights are very important, just as much as my religion. I believe in what we do here, and I believe that my faith is strong, too." Lachina's counseling further cemented Hinojos' already strong sense of purpose. But to one medical assistant at the clinic in Oak Harbor, the reality of being present during the termination of a pregnancy, in this case through medication, made her think about quitting. "We weren't doing abortions when I started here -- I'd thought that would stay closer to Seattle -- and when we did, it was really, really hard for me," said the woman, who asked that her name not be published because she fears her friends will disapprove. "I thought, 'Should I call in sick? Get another job?' "
Providing birth control is noble, she believes, as a means to prevent unwanted pregnancies. Abortion is another matter. Lachina listened to her concerns, telling her that God did not judge her and that she should not blame herself. His cleric's collar, so similar to those worn by the priests she'd been raised to obey, was especially comforting. "I'm still kind of divided in my feelings," the woman said. "But I believe that I'm doing right, and Vincent really helped me." Other Planned Parenthood affiliates are getting the message, stacking their mastheads with clergy who back abortion rights. 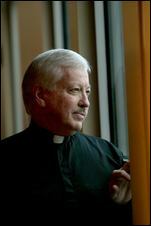 The chief executive of the Kalamazoo, Mich., affiliate is a Presbyterian minister. Offices in New York City, Oakland, Austin and Denver are among many with volunteer clergy boards, and the federation's national chaplain is a Methodist minister in Watts, Los Angeles. "Certainly, there is a strategic element to it," said Frances Kissling, president of the group Catholics for a Free Choice. "On the other hand, the purpose of the clergy is to help navigate difficult moral terrain, and abortion constitutes difficult moral terrain for a good number of women."